Ask for shortcake in England and you'll most likely be offered a triangle or two of the short, rich biscuit our Scottish cousins call shortbread. Take a trip over the Atlantic, however, and you'll get a scone-like creation, usually supporting a mountain of whipped cream and strawberries. It's a classic American dessert, said to date back to the time the colonists adapted a recipe for strawberry bread from the American Indians. My version also has an innovation: a small sprinkling of chopped rosemary added to the scone base, which gives a delicious flavour contrast to the strawberries. Preheat the oven to 200°C, gas mark 6. Lightly butter a 20cm-diameter cake tin with a removable base. Sieve the flour into a large bowl and rub in the butter until the mixture resembles fine breadcrumbs. Add the sugar and rosemary and stir in enough milk to draw the mixture into a soft dough. Knead briefly until smooth. Roll out lightly on a floured surface, and gently press evenly into the prepared tin. Bake for 15-20 minutes, until risen, firm to the touch and golden brown. Leave to cool in the tin for 5 minutes, then turn out onto a wire rack and cool completely. To make the topping, beat the Mascarpone and milk with 3 tbsp of the sugar, until smooth and fluffy. Put the strawberries in a bowl and sprinkle with the remaining sugar, Grand Marnier and orange zest. Spread the Mascarpone mix over the cooled scone base and pile the strawberries on top. Spoon over any juices left from the strawberry bowl. 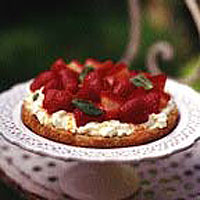 Scatter the shortcake with mint leaves and dust with icing sugar, if desired. Serve immediately.